Your traps likely aren’t short, they’re just making up for the fact that your stabilizing muscles and stabilizing much, and, well, somebody’s got to do it. Absolutely not here to diagnose you over the interwebs, but all too often I see folks smashing and stretching the ? out of their neck, when what they really need to be doing is giving it some love and then giving it some stability. I’m sure you’re sitting there saying yeah right, no way that that light tool work could be doing anything. Well, I’m also sure that most of you saying that have also been smashing and stretching your neck for months and months and not really getting anywhere, so, let’s try something new, shall we? With this feathering stroke we’re tapping into interoceptors which help provide a general sense of well-being and also reflexively decrease fascial tone by decreasing TGF Beta-1 concentrations (whoa…science). If you don’t have a tool…use a serving spoon and some massage cream…really though. Yes, those are old school isometrics, but, there’s a reason they’ve been around for so long…they work. And obviously if you have ANY kind of pain at ANY time, stop. Really, before you do any of this you should get in to see someone, but I know you’re going to ask me anyway, so I figured I’d do my best to help you out. But please, be smart. Honestly, you can use whatever mobilizing and stabilizing techniques you want, the take home here is that those traps and neck muscles aren’t tight for no reason. Be nice to them, relax them, then get the stabilizing muscles doing their job. In. That. Order. Like it? Repost it. Don't understand it? 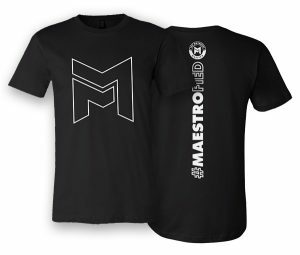 Hit me up and get #Maestrofied.